Drivers in the east metro are experiencing some big delays. It's 20 mintues on westbound 94 from 694 to Marion Street. A crash at White Bear Avenue and another ahead at 35E are causing the delays. The crash also is tangling traffic on southbound 35E. It's 20 minutes from 694 to 94. A pair of wrecks is out of the way on northbound 35W at Cliff Road. Plan on 15 minutes from County Road 42 to 494. It's no picnic on westbound 494. Look for a wreck blocking the left lane at Portland Avenue. It's busy starting at 24th Avenue. Drivers on southbound Hwy. 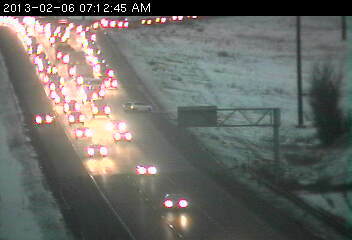 169 will need to navigate around a stall blocking the left shoulder at 63rd Avenue. A tanker is blocking the exit ramp from County Road E2 on southbound 35W. It's 15 minutes fromm County 10 to Hwy. 280. The left lane is blocked with a crash on southbound 494 at East Fish Lake Road. That's slowing traffic on eastbound 94 coming in from Weaver Lake Road.